I'm a big fan of the Bouchon Bakery cookbook. 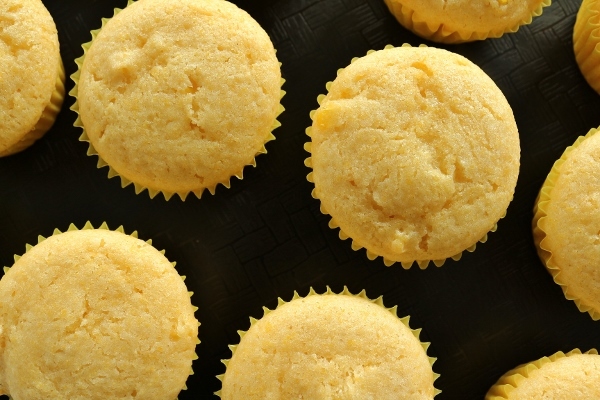 Although many of its recipes are time consuming and challenging, some of my favorites are actually the muffin recipes--simple but delicious. So far I've made three of the muffin recipes, and I've made them multiple times! 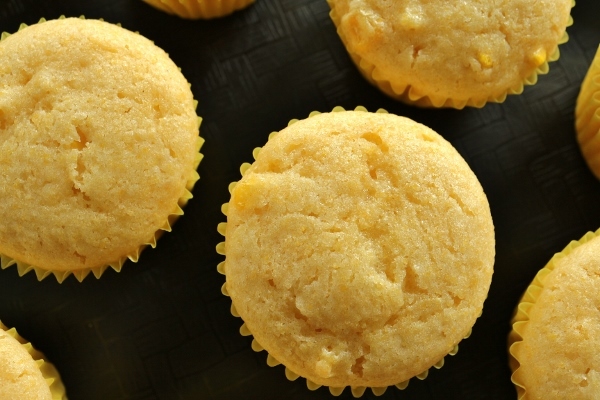 Previously, I've created the pumpkin muffins and the banana muffins, but I recently needed some cornbread for a stuffing recipe (stay tuned this Thursday) and decided to throw together these easy-to-make corn muffins. Not only were the freshly baked muffins perfect for breakfast, but I used four of them (the standard size) for my stuffing. These are incredibly moist--just like all the other Bouchon Bakery muffins I've made--due to the fact that the batter is made at least a day in advance to give the flour (and in this case cornmeal also) time to really absorb some of the liquid and soften before baking, yielding very tender-crumbed muffins. These muffins aren't too sweet, making them perfect for either savory or sweet applications (heck, I used them for stuffing!). You could easily add a little jalapeno and grated cheddar to the mix to make them even more savory, but they really are perfect just as they are. I love having extra little bites of corn in there too. 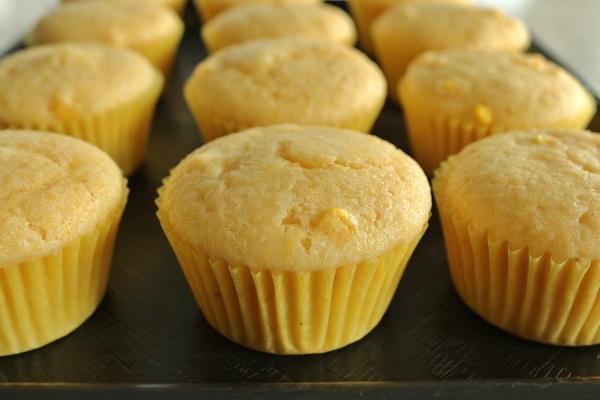 Stay tuned for a fun recipe this Thursday utilizing some of these corn muffins (it's inspired by a scary movie, and just in time for Halloween). 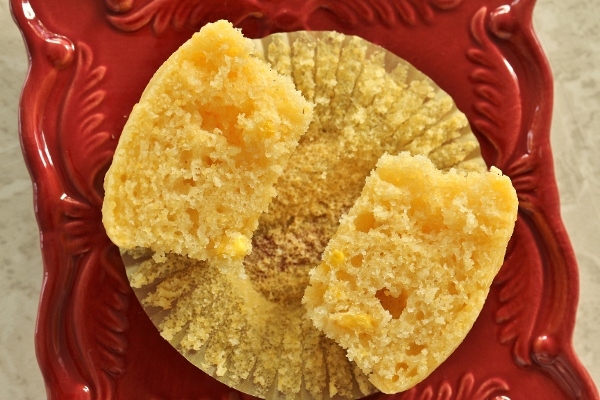 This is an excellent go-to recipe for any lover of corn muffins! The Bouchon Bakery cookbook never fails to impress me, from the seemingly simple but exceptional muffins to its more complex recipe offerings. Place the flour in the bowl of a stand mixer fitted with the whisk. Sift in the cornmeal and baking powder. 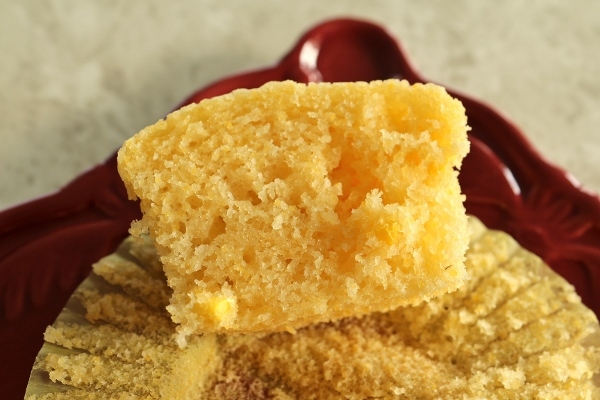 Rub any lumps of cornmeal left in the strainer to break them up and add to the bowl. Add the sugar and salt and mix on the lowest setting for about 15 seconds to combine. Add the milk and eggs and mix on low speed for about 30 seconds, until just combined. With the mixer running, slowly pour in the oil, then increase the speed to medium-low and mix for about 30 seconds to combine. (I actually did this entire mixing process by hand in a mixing bowl with a whisk and it worked just fine). Remove the bowl from the mixer stand and scrape the bottom of the bowl to incorporate any dry ingredients that have settled there. Fold in the corn. Transfer the batter to a covered container and refrigerate overnight, or for up to 36 hours. Spoon the batter evenly into the papers (I used an ice cream scoop), stopping 1/2 inch from the top (135 g each for jumbo muffins and about half that for standard muffins). 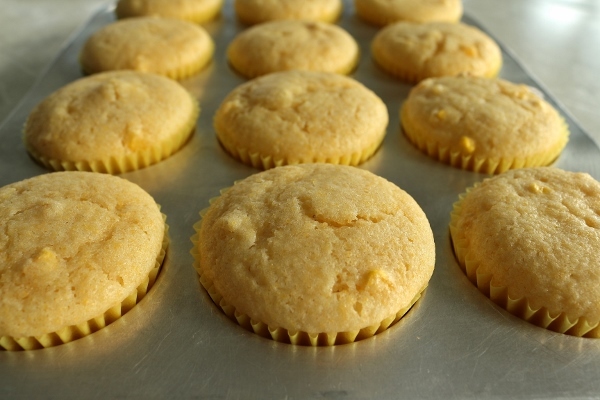 Place the pan in the oven, lower the temperature to 325 degrees F, and bake for 35 to 38 minutes for jumbo muffins or 24 to 26 minutes for standard muffins, until the muffins are golden brown and a skewer inserted in the center comes out clean. Set the pan on a cooling rack and cool completely.